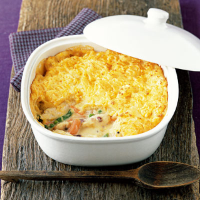 Creamy chicken and vegetables are topped with cheesy mashed potato in this easy pie that all the family will love. Preheat the oven to 200°C, gas mark 6. For the topping, place the potatoes in a large pan and cover with cold water. Bring to the boil and cook for 15-20 minutes or until tender. Drain well then add the milk and butter and mash until smooth. Stir in the cheese and beat until it has melted. Season to taste. While the potatoes are cooking, place the chicken fillets, onion, oil and cornflour in a 1.5-litre ovenproof serving dish and stir to combine. Place in the oven and cook for 20 minutes until the onion has softened and the chicken has started to brown a little. Heat the stock and combine with the crème fraîche in a small jug. Remove the chicken from the oven and pour over the stock mixture. Stir in the frozen vegetables and season with black pepper. Spoon the mash on top, starting at the edges of the dish (this makes it easier) and smooth over. Place on a baking tray in the oven and bake for 25-30 minutes, or until the topping is golden and crusty. Leave to stand for a few minutes before serving with a steamed green vegetable such as broccoli. Mini chicken fillets are perfect for this dish as they can be left whole, are very tender and don't require any cooking beforehand. Breast fillets could be used instead - just cut into bite-sized pieces.